Quirky UPBEAT could be categorized as a latin uncial. “Uncial” because it has one case, of x-height plus ascenders and descenders in the style of so-called uncial and half-uncial fonts. “Latin” because of the triangular serifs which give the font a lively texture. I love alternate characters and UPBEAT has its share. Use these to create variety in your lettering. Located in the lowercase positions. Each font (Regular, Demi, Bold) includes single case letters plus alternates, numbers, punctuation, and international characters. RINGPIN was inspired by the style of body piercing. Not my own style, but interesting to observe. In designing this font, I was rather limited to geometric components, and drew each with a crisp highlight. Most letters take the lowercase form, sometimes with alternates. The letters did not want to align neatly, so they assume a variegated arrangment. Includes 1-3 versions of each letter, plus numbers, punctuation, international characters, and many fanciful extras. QUEER THEORY is my attempt to make a monospaced font with a less predictable feel. I was thinking about fonts like Envision, Democratica and Rotis Semi Serif, with their hybrid letterforms and irregular application of serifs. The basic letterforms of Queer Theory were derived from the invisible classic Courier, fusing upper and lowercase in a way that suggests an uncial. Unlike your average Courier though, this font has very square–not rounded–slab serifs. Includes single case letters, numbers, punctuation, and international characters. PALIMPSEST is an experimental font combining the letterforms of a traditional blackletter font with the texture of a Benday or halftone dot screen. Modern + Medieval. Pop + Parchment. At first glance it appears somewhat blurred or faded but is very cleanly rendered from vector drawings for smooth edges at any size. (Bigger is better.) Includes upper and lowercase, numbers, punctuation, and international characters. PALIMPSEST comes in four weights: Light, Regular, Dark, and Black, which can be mixed and matched for interesting effects. The graphics above show only the Regular weight; at left are all four for comparison. CHINESE GOTHIC is an experiment, another font mashup. 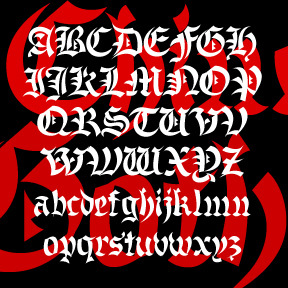 What would happen if you crossed a pseudo “Chinese” font with a blackletter? Although they have very different origins, they have a comparable form; both are calligraphic, fragmented, and high contrast. I used Monotype Old English as a guide and drew and arranged three-point “brushstokes” in the manner of Wonton and many other such fonts. Check out this citation on a German fraktur site. The full font includes caps, lowercase, numbers, punctuation, and international characters. ALSACE-LORRAINE is an experiment. My idea was to combine aspects of a vertical French script and a German fraktur. For the most part, the top is the German and the bottom is the French. 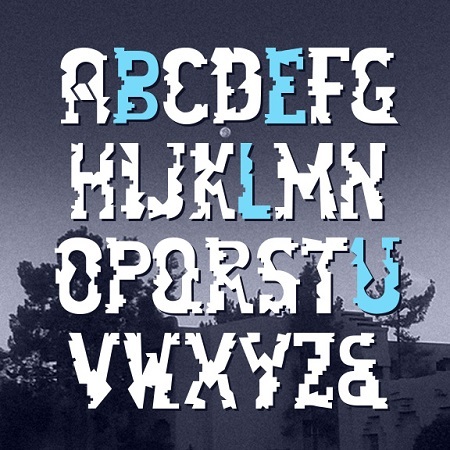 A font “mash-up” before that word was coined. Named for the region from which my father’s father’s family emigrated. Includes caps, lower case, numbers, punctuation, and international characters.